Unit from Smithsonian multidisciplinary ocean curriculum. 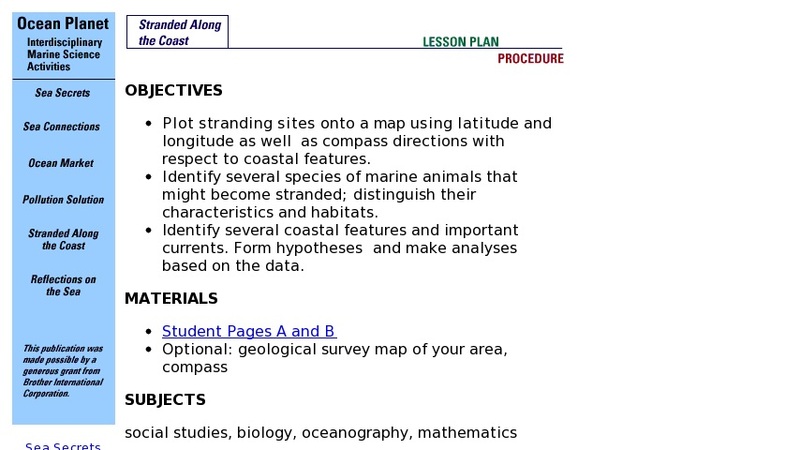 Lesson plan focuses on how dynamic coastlines, oceanographic conditions and human activities affect marine animals such as cetaceans, pinnipeds and sea turtles. Students study sea turtle migrations, use math skills to plot sea turtle strandings on the Atlantic Coast. Unit includes: background essay; teacher instructions; maps for student activity; discussion questions; all online in PDF format. Resources include online version of Smithsonian Ocean Planet exhibition.